Three teenagers have been jailed for life for hacking a friend to death with two scythes in a field near Sheffield. John Sawdon, Jermaine James, both 17, and 16-year-old Rebecca Peeters - named by a judge on Thursday - pleaded guilty to Terry Hurst's murder in January. 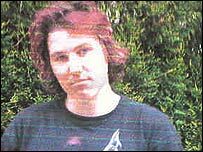 Terry, 17, of Penistone, was targeted by the three during a camping trip to Broomhead Reservoir in July 2004. More than 60 wounds were found on his body. Sawdon will spend a minimum of 15 years in jail, Peeters and James 13 years. Peeters was 15 at the time of the murder. Mr Justice Andrew Smith, at Sheffield Crown Court, told the trio their offence was chilling. "You knew he would be defenceless. "You found him in a tent and set about him mercilessly. He couldn't escape. "You all chased him and caught him and continued the attack." Mr Hurst, who suffered learning difficulties, was kicked, stamped on and had a plastic bag put over his head as well as being attacked with the agricultural scythes. 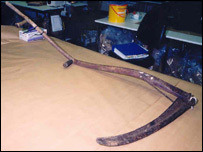 The court heard the trio left the largest scythe embedded in their victim's neck. "You intended to kill him. It was the cruellest of all crimes and perhaps the more terrible because teenagers committed it," the judge added. Speaking after the sentencing Mr Hurst's family said they would like to say how relieved they were that justice had been done. His mother, Audrey Hurst, said: "This horrific murder has been with us night and day. "The total disbelief of it all will take time to sink in, if ever. "We are now going to try and bring some normality back to our lives." Det Supt Kevin Hardy said the motivation for the attack was not clear. "There is some suggestion of a young girl Mr Hurst used to go out with who then went out with John Sawdon. "John Sawdon has been known to make threats to people about what he would like to do to Terry and mentioned he would like to kill. "Why that would lead to such an horrendous attack is beyond my comprehension," he said. He said James only met the 17-year-old the day before and Peeters hardly knew him. He also added it was a unique case. "To get three young people to agree and participate in such an horrific attack is unique - this is not a reflection on society today."